Green house are climate controlled Technologies. Ferrum Green Houses have a variety of applications, the majority being, off-season growing of vegetables, floriculture, planting material acclimatization, fruit crop growing for export market and plant breeding and varietals improvement. Ferrum Green Houses are built of a G.I. structure wherein crops are grown under a favorable artificially controlled environment and other conditions viz. temperature, humidity, light intensity, photo period, ventilation, soil media, disease control, irrigation, Fertigation and other agronomical practices throughout the season irrespective of the natural conditions outside. - Production schedule can be planned as per market need. - Off-season production of vegetables & fruit crops. - Efficient utilization of chemicals, pesticides to control pest & diseases. 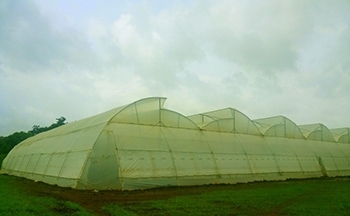 - Protection of plants from winds & hailstorm.